Typical weddings require over one-thousand decisions on your part. Wow! That’s a lot! The key to stress-free wedding planning is a sense of humor and a well-organized wedding plan. Stress-free wedding planning begins with a good laugh! 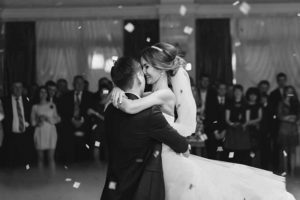 By the same token Queen City DJs are masters at helping you create a well-organized wedding entertainment plan that runs like clockwork. We coordinate details with all your wedding vendors to create a well-oiled machine at your wedding celebration with no surprises. For the record, Mr. Atkinson would never cut it as a DJ with Queen City DJs! We offer only the cream of the crop wedding DJ and MC talent in the area. In other words, you can simply enjoy your wedding day knowing we’ve got you covered. Stress-free wedding planning begins with Queen City DJs. 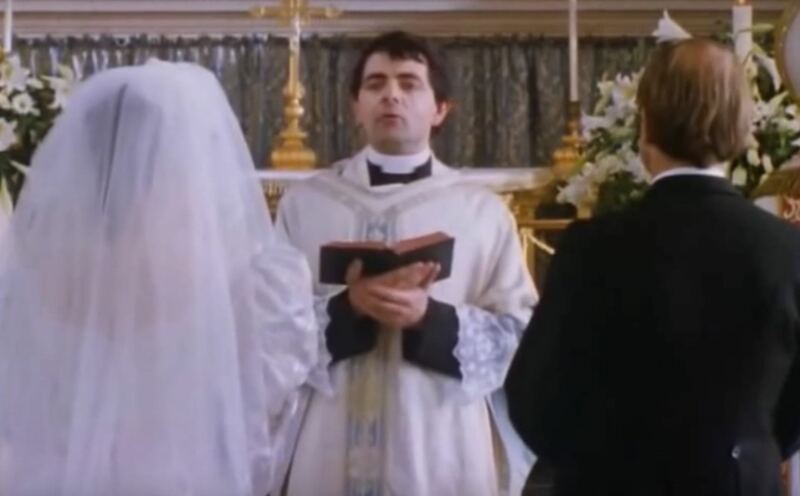 We offer an extensive array of wedding planning tools which allows such tight coordination, that not even a Rowan Atkinson character could muck it up! This is a classic scene from “The Scent of a Woman.” Al Pacino’s character is blind. That doesn’t stop him from dazzling a young woman on the dance floor with a tango. She voices her concerns about making a mistake, which prompts Pacino to utter that famous line in the headline above. Here’s your takeaway: If you are planning a wedding, there is only one major mistake you can make, and that is to scrimp on the entertainment. Seriously. 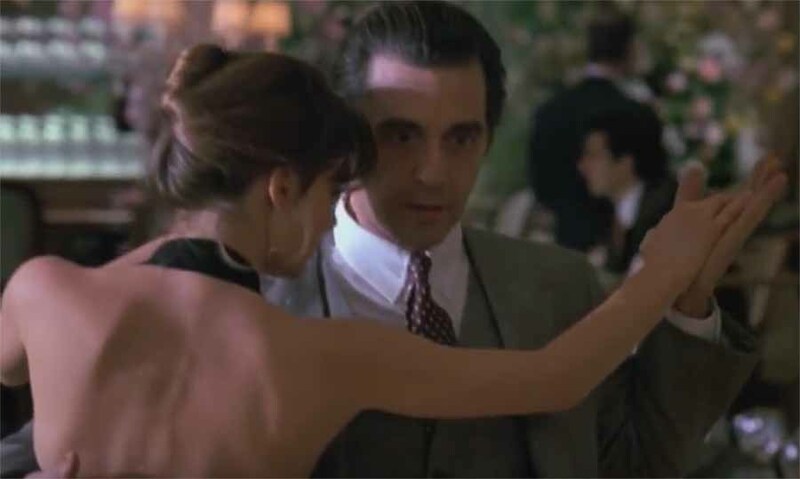 Watch the video below as Pacino deftly guides the young woman, played by Gabrielle Anwar, through the intricacies of the tango even though she has never danced it in her life. The imperfections of her dance are invisible because Pacino knows exactly what he is doing and, as a result, he makes her look wonderful. That is what Queen City DJs offers you: no limits entertainment that makes your wedding look and feel wonderful. Entertainment is the great equalizer at weddings. We know what we’re doing, which is to pack your dance floor and show your guests a great time, which makes YOU look wonderful! 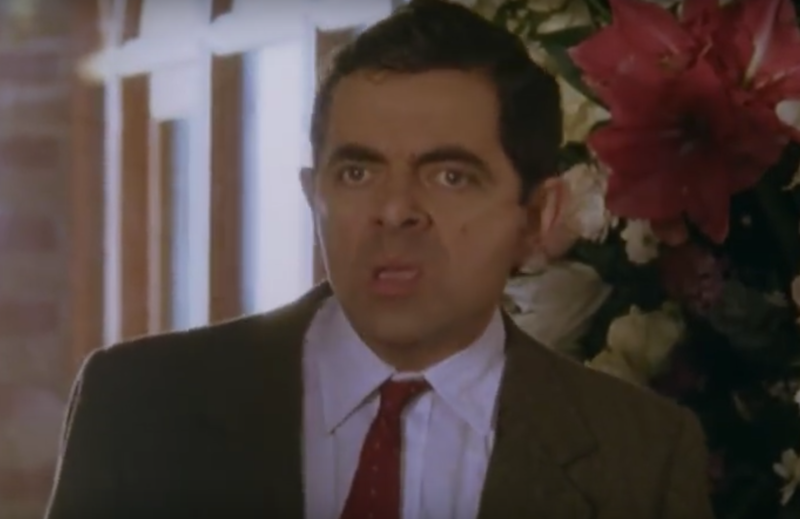 Let’s go back to the Pacino video above. Did you notice the musicians? Very nice, except that 2 out of 3 brides prefer a DJ to live musicians according to a survey done by The Knot. There are good reasons why, beginning with price. DJ entertainment is affordable for everyone. And Queen City DJs offers enhancements like lighting and photo booth that takes your celebration to a no limits level that makes the video above look like a bingo game at the old folk’s home. No limits: we play any style of music! There’s more. We can play more than tango music. In fact, we can play about anything you’d like. But if you like tango, you’re not limited to what a few string players with an accordion player can play. With Queen City DJs, the sky’s the limit. Do you like the tango music of the Italian chanteuse, In-Grid? Okay, you’ve got it! How about a little Julio Iglesias? No problem! How about some Michael Bublé? Your wish is our command! Okay … that’s not really a tango, it’s the marimba. But that’s the whole point when you select Queen City DJs: you’re not locked into a certain style of music all night long. The sky’s the limit … even with a limited budget … which is 99% of the brides in America! If you and your betrothed know your way around the dance floor, well, just let us know. We’ll have the music you need to allow you to live out your “Zorro” fantasy and look just like Antonio Banderas and Katherine-Zeta Jones on the dance floor … or whatever style of music is your fantasy. When you go with Queen City DJs, there are no limits on your fun. Your future wife is your sweetheart for life. Keep that in mind as you read this blogpost that explores the challenge of the perfect wife gift. Men, you are entering an area of opportunity … and landmines! Beware, a false move can get you in the dog house faster than you can say “vacuum cleaner!” By the same token, the right move can create beauty, joy, and passion to nurture your marriage for a lifetime. We talked to a man who can help you. This gentlemen has been married many years and has enjoyed a beautiful, happy marriage. His wife is his best friend. He is his wife’s best friend. In other words, he can do nothing wrong, right? Let’s call him Joe. Joe has found himself in the doghouse on more than one occasion thanks to poorly conceived gift ideas. He reveals some of the wife gift mistakes he has made. So he gave his wife flowers on her birthday; on their first wedding anniversary; on Valentine’s Day. And the next year, he repeated the same formula … until his wife rebelled. She knew he was putting no thought into the gift any more. Flowers were great when purchased with feeling. They weren’t great when it appeared he was buying them to make his life easy and get it over with. Then there was the year he gave his wife a functional item, a foldable kitchen stool for Christmas. Ouch! Practical doesn’t work with most women. It didn’t matter that he also gave her a bottle of her favorite cologne. The practical gift expunged the benefit of the romantic gift. To compound his gift-giving gaffe, he gave her cologne every year for Christmas, a classic “automatic pilot gift mistake.” (See above.) Two wife gift mistakes in one single holiday! As problematic as the mistakes above are, it can actually get worse. Some men swing to the other extreme and buy super extravagant gifts. And then they try to outdo themselves year after year. You can see the risk potential here, like running out of money! Seriously, it’s not the size of the gift, it is the thought behind it that counts. Sometimes guys buy big, expensive gifts, or even small expensive gifts, like jewelry, in an attempt to make themselves look good. Keep in mind, there is nothing wrong with jewelry, and there is much right with it. Are you buying an expensive diamond necklace because your wife really wants it, or do you just want to show off? Here’s the bottom line: listen. Listen to hints your wife drops in your day to day living. If she sees something in a catalog or online that she comments on, don’t just make a mental note, make a list and write it down. That way, when you present her a gift she really, really wants, she’ll know that you listened. Queen City DJs specializes in launching couples on their way with fabulous wedding entertainment. Are you engaged? Be sure to check out our planning tools. Great wedding entertainment is a tremendous gift to yourselves and your guests! A couple of professors at Emory University conducted a study on weddings and marriage. One of their findings was pretty amazing. 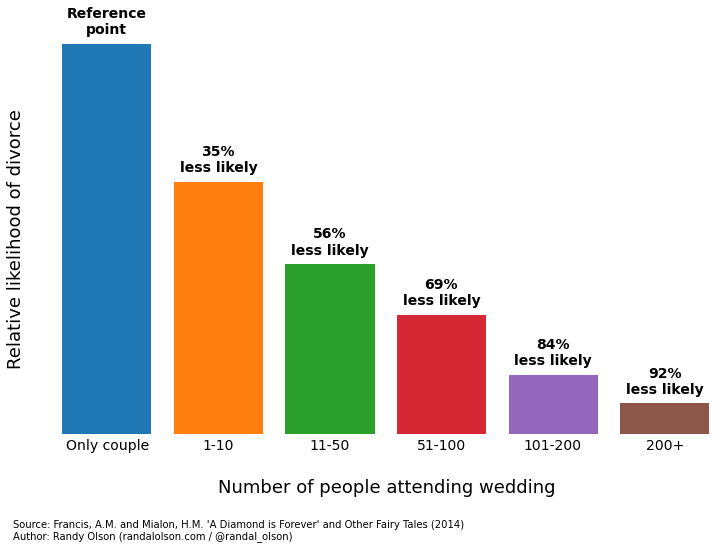 The more people you invite to your wedding, the more likely your marriage will be successful. A couple that invites ten people to their wedding is 35% less likely to ever get divorced than a couple who exchange vows without any guests. Your wedding guest list should be big, no, make that huge! Your marriage may depend upon it! Let me explain. Even more dramatically, couples that invite more than 200 guests are 92% less likely to get divorced than couples with no guests. In other words, when you have a large group of family and friends, they have a vested interest in your well-being. They help provide the emotional “safety net” to nurture and sustain your fledgling family over the years. Community matters to your marriage as you travel on your new journey together. 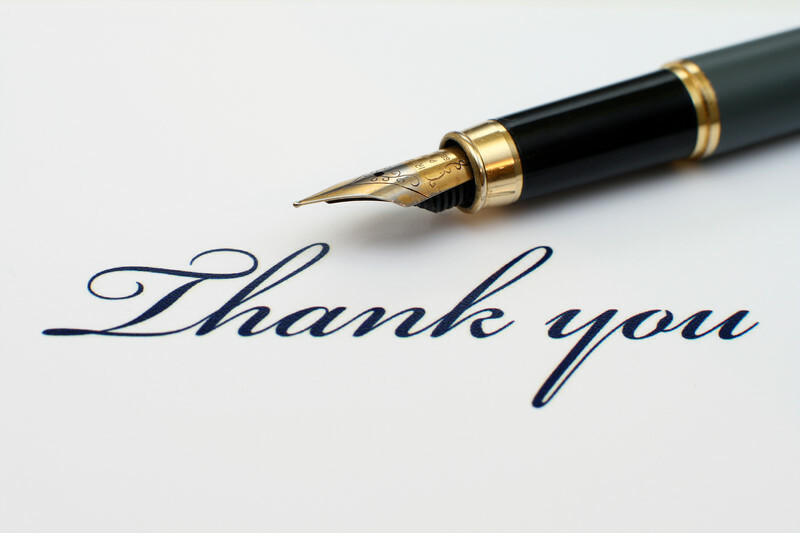 Last week’s blogpost dispensed wedding guest list advice. We focused on practical ways to cut your list down to size to accommodate your wedding budget. However, in light of this research, perhaps conventional thinking is backward. Perhaps the proper way to plan your wedding is that your wedding budget needs to accommodate your guest list, not the other way around. It’s more important to get your community out in full force for your life-changing wedding celebration, even if you need to cut back a little on the menu or the flowers. The love and prayers your “community” brings to your marriage is more important than a sit-down dinner verses a buffet. Queen City DJs offers a full palate of wedding entertainment options that are easily customizable to fit your budget. 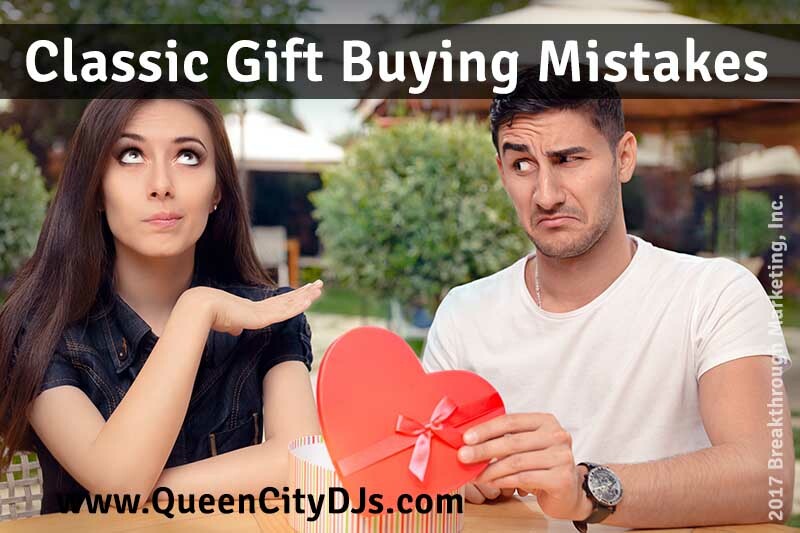 You never have to scrimp on the fun with Queen City DJs! Who NOT to invite to your Cincinnati wedding, that is the question! Few issues cause more friction in the wedding planning process than the guest list. Here is some wedding guest list advice to simplify the process. —> Your budget is limited, so you can’t afford to invite everybody you’d like to. —> Your parents want you to invite people you don’t know very well. 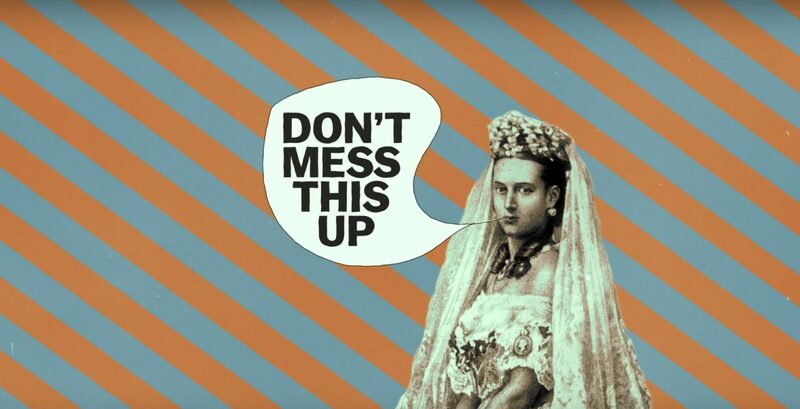 —> Your future in-laws want to invite more people on their side of the family than yours. —> Which co-workers get invited, and who doesn’t make the cut? 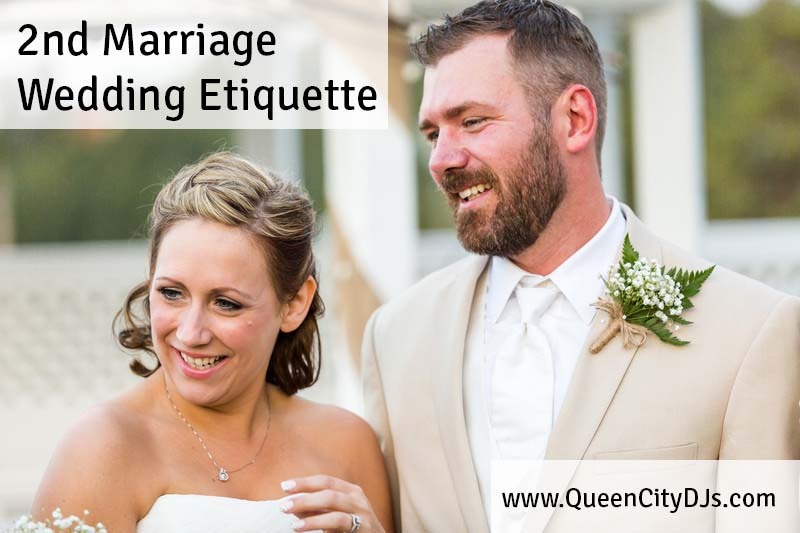 Think of the delightful moments you’ll want recorded forever: your entrance and the wedding vows; the cake cutting and the first dance; and the entire celebratory fervor which Queen City DJs helps to cultivate. This is life at its best. The moments captured by your wedding photographer matter. These are the images you’ll cherish for the rest of your life. This approach goes beyond photo journalism by transforming a documentary approach into an artistic approach. It especially lends itself to photographers who still use film, which is dying breed. However, good digital photographers can still create art with creative use of the focal length of the photograph. You know what I mean: the subject in the foreground is in focus, but the background is blurred. 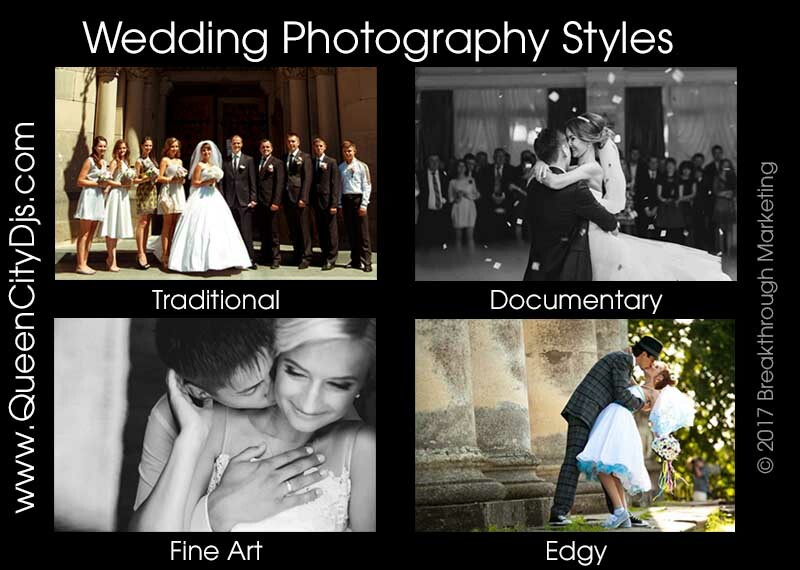 Yes, this style documents your event, but from the artistic perspective of the photographer, who typically prefers black and white to color photography. Queen City DJs likes to know the style of wedding photography you prefer. It helps us to collaborate with you in designing the wedding entertainment look and feel perfect for you. The video below poses the question, “why are weddings so darn expensive?” It suggests that wedding prices are just plain too high. Queen City DJs love price questions! Queen City DJs love price questions when it comes time for you to plan wedding entertainment. The video offers good advice: offer potential vendors a price range that fits your budget, which helps us present you with the options and add-ons right for your style and budget. Queen City DJs is proud of our website. It reflects who we are. Spend a little time on it, beginning with our wedding services page. Check out our planning tools. And then contact us. Nothing beats a phone call (1-513-659-9293) to help you get to know a company and receive the exact info you’re looking for. You’ll spend less time planning your wedding with a destination wedding. A lot of wedding couples appreciate the entire stress-free vibe of less planning. When planning a wedding in the bride’s home town, couples have to make well over 1000 decisions. Each decision is a cause for stress. Destination weddings at resorts often provide turnkey packages which include an onsite wedding planning consultant which radically reduces stress-causing decisions. Let’s face it, not everyone can afford to haul their entire family off to your destination wedding. You may find yourself deprived of loved ones who you really would like to share in the biggest day of your life. Even more, family members who would like to come may be resentful that you’re putting them in a position of mortgaging the house to fly off to Timbuktu to indulge your destination wedding fantasy. Then there is the issue of mobility and age. Elderly grandparents and aunts may not be up to traveling long distances. On the other hand, do you have problematic family members you’d rather not attend your wedding? 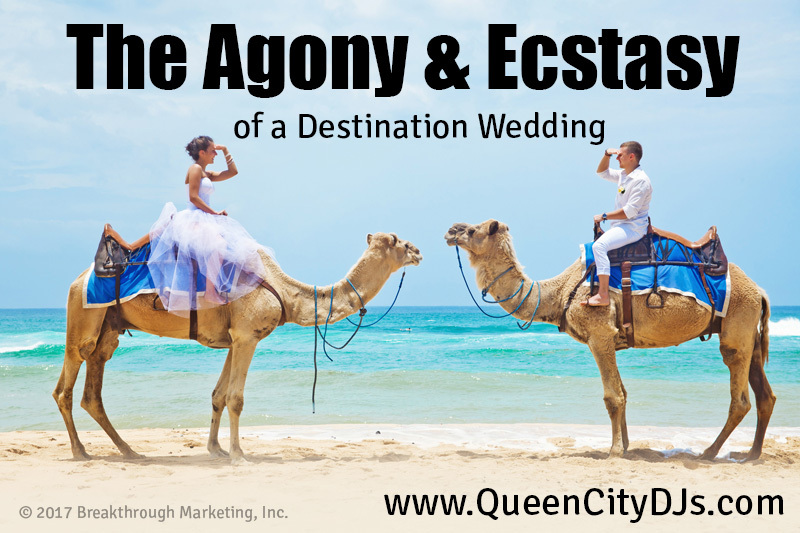 Destination weddings are a great way to whittle back your list! 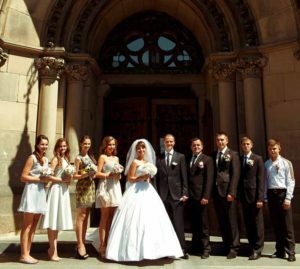 If you’re getting married in another country, you may have to wrangle with a different language while getting all the proper forms necessary to get married there, especially if you’ve been divorced before. That’s why destination weddings are more popular with younger couples getting married for the first time. By combining your ceremony and honeymoon, you may be able to get a package that makes a dream honeymoon location more affordable. Think about this carefully: do you want your family hanging around on your honeymoon, because it’s something you may have to deal with if you have a destination wedding. After all, they may not want to shell out all those bucks just to pack up and jet home the next day. You may find yourself entertaining Uncle Buck when you’d rather be relaxing in your honeymoon suite. Some resorts schedule lots and lots of weddings in a day. You may see a lot of other brides and their guests flitting around. And then there are beach weddings. How would you feel if the ‘tall and tan and lovely girl from Ipanema’ saunters by while you’re saying your vows and all eyes are on her … and not you? Just askin’! Despite their best efforts, resort staffers may not be able to keep the public at bay. If you hold your wedding right here in the Cincinnati area, you can enjoy unrivaled wedding entertainment with Queen City DJs! No need to travel halfway across the world! Is a destination wedding right for you? For most couples, the agony outweighs the ecstasy.